The focus at the ICA’s magnificent Stellenbosch campus falls on intensive individual training for small, select groups. Students are exposed to the full circle of an holistic approach to all things food-related, from harvesting fresh herbs, olives and fruit in the organic gardens, using only the best produce during the practical curriculum that remains based on classical French cuisine principles, to – at the end – recycling for compost and fertilizing purposes. 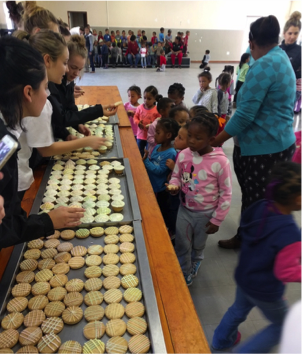 The ICA and its students are also actively involved in local feeding schemes. All of these aspects instill a deep-routed appreciation for the trade of a chef. In keeping with our social ethos, the ICA remains committed to supporting the Banhoek community. With spring slowly creeping into the valley, ICA students continued the annual tradition of personal service at the local soup kitchen in nearby Kylemore. Tannie Siena, as the organiser of the soup kitchen is fondly known, works hard to provide warm meals for those in the community who need it most. For several years, the ICA has joined hands with her and the school has been providing ingredients for this purpose on a weekly basis. Practicing their piping skills in the Pâtisserie kitchen, the students also decorated cupcakes and cookies to hand out during their community service day.